With the Islamic State and other dangers, AP foreign correspondent Kathy Gannon calls it a "brutal time for journalists," after accepting the School of Journalism's Zenger Freedom of the Press Award. Click here for her speech. The AP reporter says she wants to return to Afghanistan to thank the doctor who saved her life. She also tells the audience how she became a reporter and what she thinks of the U.S. involvement in the country, in a Q-and-A with Arizona Public Media reporter Mariana Dale ('14) and School of Journalism Director David Cuillier. Click here for the discussion. 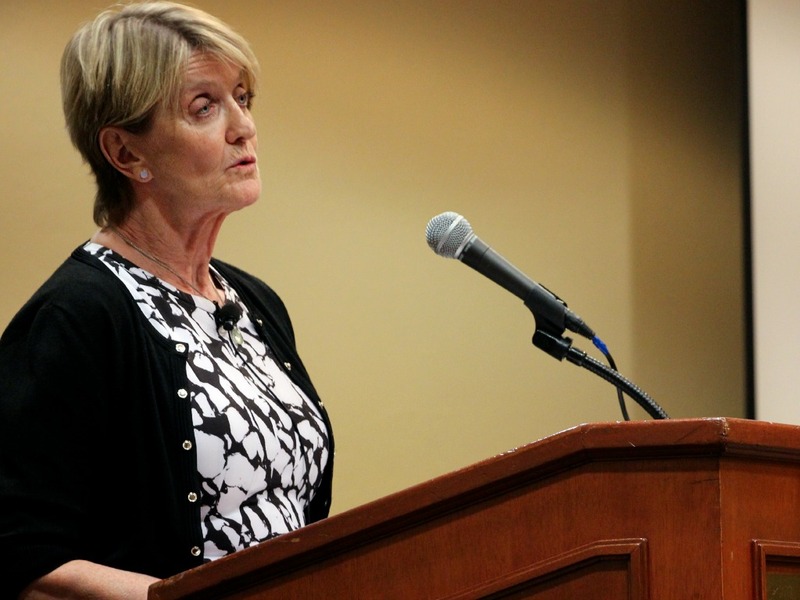 Associated Press foreign correspondent Kathy Gannon, who is poised to return to Afghanistan despite being badly wounded there in an attack, has received the 2015 John Peter and Anna Catherine Zenger Freedom of the Press Award. While covering the 2014 Afghan elections, Gannon and AP photographer Anja Niedringhaus were shot by an Afghan police commander. Gannon spent months recovering from her injuries. Niedringhaus, 48, died at the scene. Gannon said she is honored to receive the Zenger Award, given annually since 1954 by the University of Arizona School of Journalism. "The award reminds me of the past sacrifices that have been made in the name of press freedom," Gannon said, "and the responsibility we bear as reporters to respect those sacrifices by doing our job. "The job we do as reporters is to ask the tough questions, to not let governments dictate the conversation and remember that we are not advocates but recorders of history." Gannon, 61, spent more than 18 years reporting from the front lines in Afghanistan, and served as Associated Press regional chief. She won the International Women's Media Foundation Courage in Journalism Award in 2002 and received an Edward R. Murrow fellowship from the Council of Foreign Relations in 2003. She is the author of "I is for Infidel: From Holy War to Holy Terror in Afghanistan," published in 2005. "Press freedom is under attack in both the developing and developed world," Gannon said. "Dictators and democracies have played with press freedom. Sometimes it is subtle and other times not so much." Despite several reconstruction surgeries on her left arm, Gannon has vowed to return to reporting from the Afghanistan-Pakistan region after she is cleared by doctors. "There are stories left untold," Gannon told the Canadian CBC News. "I don't want to be held hostage to this shooting. "I don't want it to define my future." Gannon took six bullets through her left arm, left shoulder and right hand in April 2014. She and Niedringhaus had just arrived in a car at a heavily guarded district compound and were waiting for a convoy to move forward when a unit commander namedf Naqibullah "walked up to the car, yelled 'Allahu anjaAkbar' (God is Great) and opened fire on them in the back seat with his AK-47," according to the AP report. An Afghan court sentenced the commander to 20 years in prison. Gannon was honored at this year’s Zenger reception and dinner on Oct. 23 with her husband, Pakistani architect and art gallery owner Naeem Pasha, by her side. Niedringhaus was honored the night before at a reception for an exhibit of her photos at the Union Gallery in the UA Student Union. The exhibit will continue through Nov. 6. 1967 — John S. Knight, Knight Newspapers, Inc.